Background: Since the last two decades, there has been more focus on the development strategies related to Anti-Alzheimer’s drug research. This may be attributed to the fact that most of the Alzheimer's cases are still mostly unknown except for a few cases, where genetic differences have been identified. With the progress of the disease, the symptoms involve intellectual deterioration, memory impairment, abnormal personality and behavioural patterns, confusion, aggression, mood swings, irritability Current therapies available for this disease give only symptomatic relief and do not focus on manipulations of biololecular processes. Methods: Nearly all the therapies to treat Alzheimer's disease, target to change the amyloid cascade which is considered to be important in AD pathogenesis. New drug regimens are not able to keep pace with the ever-increasing understanding about dementia at the molecular level. 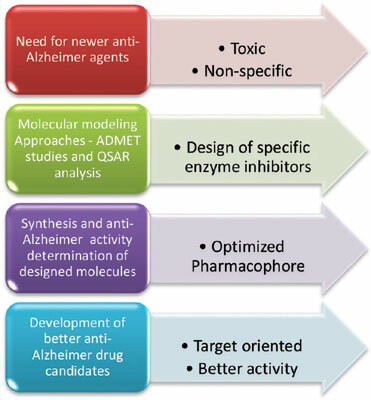 Looking into these aggravated problems, we thought to put forth molecular modeling as a drug discovery approach for developing novel drugs to treat Alzheimer disease. The disease is incurable and it gets worst as it advances and finally causes death. Due to this, the design of drugs to treat this disease has become an utmost priority for research. One of the most important emerging technologies applied for this has been Computer-assisted drug design (CADD). It is a research tool that employs large-scale computing strategies in an attempt to develop a model receptor site which can be used for designing of an anti-Alzheimer drug. Results: Various models of amyloid-based calcium channels have been computationally optimized. Docking and De novo evolution are used to design the compounds. They are further subjected to absorption, distribution, metabolism, excretion and toxicity (ADMET) studies to finally bring about active compounds that are able to cross BBB. Many novel compounds have been designed which might be promising ones for the treatment of AD. Conclusion: The present review describes the research carried out on various heterocyclic scaffolds that can serve as lead compounds to design Anti-Alzheimer’s drugs in the future. The molecular modeling methods can thus become a better alternative for the discovery of newer Anti- Alzheimer agents. This methodology is extremely useful to design drugs in minimum time with enhanced activity keeping balanced ethical considerations. Thus, the researchers are opting for this improved process over the conventional methods hoping to achieve a sure shot way out for the sufferings of people affected by Alzheimer besides other diseases. Alzheimer's disease, QSAR, molecular modeling, docking, methodologies, drug research.